Hey Jewel Fans! We’ve got a really special interview to share with all of you today. 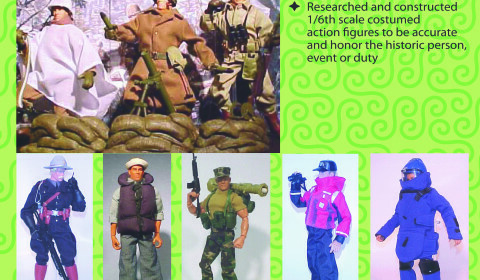 You may remember back in December we had the opportunity to feature several of the toy designs for the never-produced third wave of toys. These designs were courtesy of Greg Autore, the Art Director behind Princess Gwenevere and the Jewel Riders. We reached out to Greg with a few more questions after featuring the designs, and are so, so excited to share his responses with you. Please enjoy! 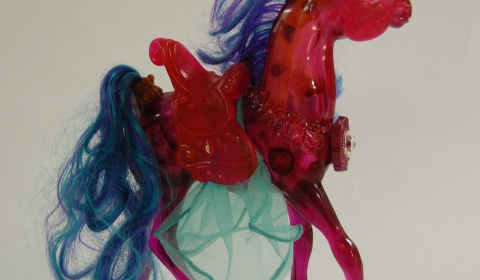 The Jewel Riders Archive: First off, can you tell us about your history as a toy designer? 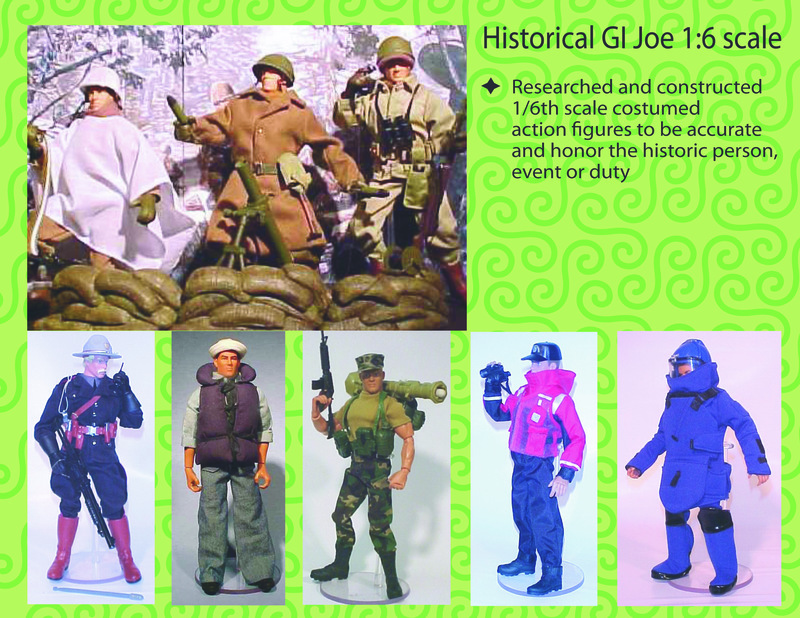 Greg Autore: I started in 1984 as an intern with Mattel and am still designing toys and children’s products. Toys I have worked on (a short list): All of Sabrina the Teenage witch, All Disney fashion dolls from 1989 to 1994 (that is a bigger story to tell sometime), first year of Disney Musical Princesses (I used those bodies and heads for the first Gwen dolls), Star Wars, Popples, Hooks, Peppermint Rose, GI Joe, Trolls…and tons more. In those cases I had a major impact on all those lines. 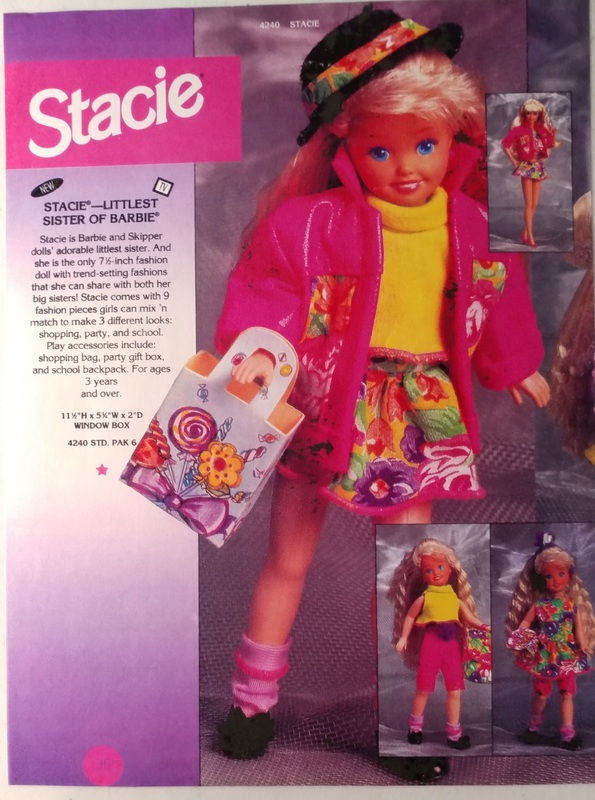 But there are many other smaller things, for instance, I created the very first Barbie’s little sister doll Stacie. 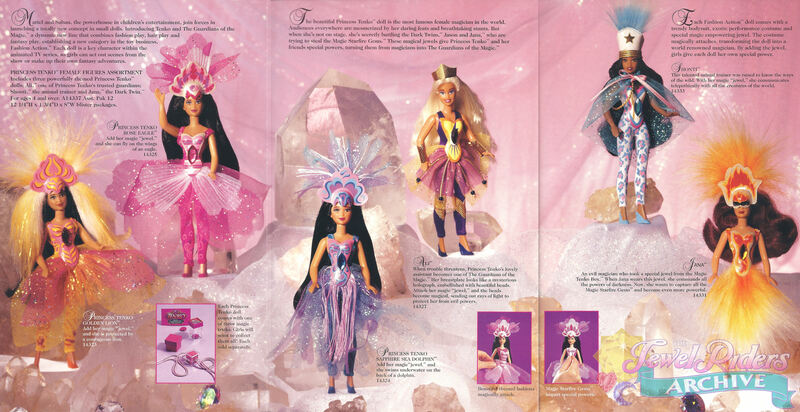 I saw a gap in the play pattern since there was no child doll close to the age of the children buying Barbie. (Skipper was a young teen and the babies from Heart Family were toddlers.) So, when I was put on a short term team of cross functional designers to come up with new concepts, Stacie is one thing I did. 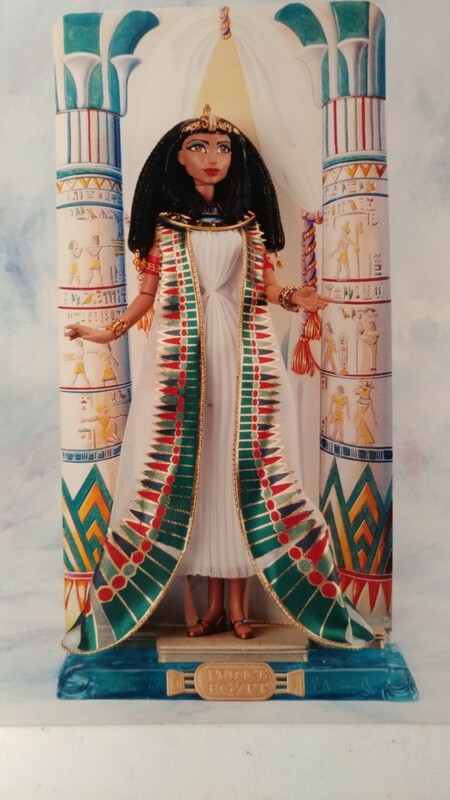 I used the body from Lady Lovely Locks and took the head from Skipper and chemically shrunk the head to fit. 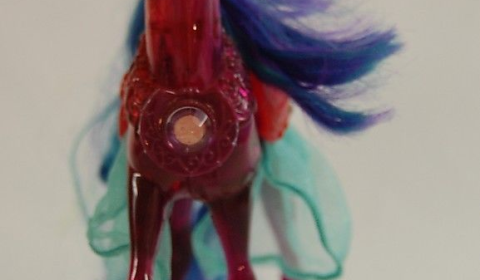 After it was accepted, one of the Barbie designers cleaned it up. 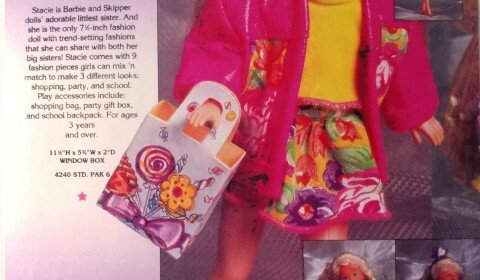 She was originally designed to be wearing her big sister Barbie’s pink letter jacket. It still has the basic look from what I designed. JRA: Wow, that’s an incredible background in toy design. But how did you get involved with Jewel Riders? GA: Part of the Kenner process is to always look for new properties or inventions. When they arrive, Design and Marketing review them and some are picked to go to the next step to make test models and get early consumer feedback. 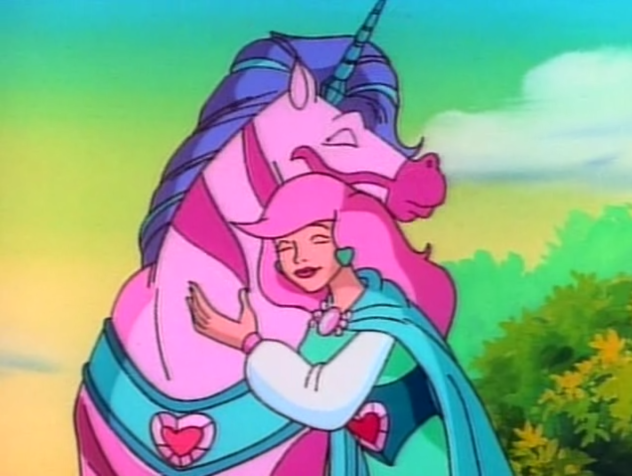 I was given several scripts and loved “Enchanted Camelot” when I first read it. 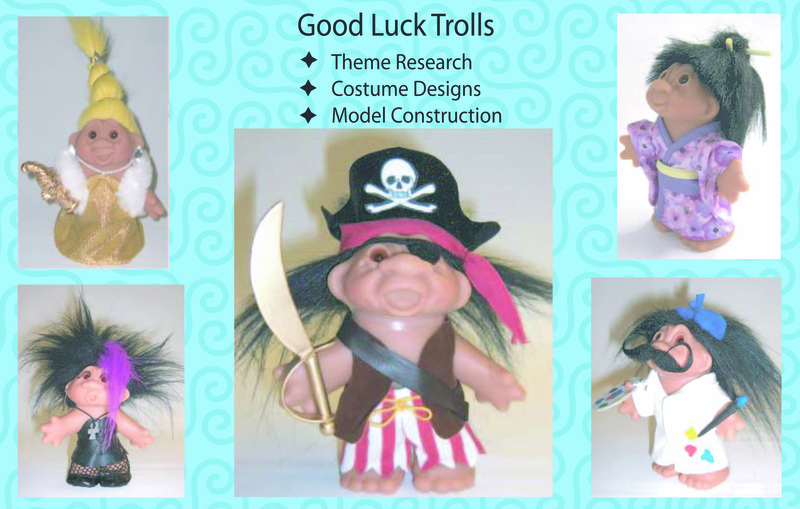 So, I pushed for getting it into the tests and was assigned to adapt it into a viable toy line. 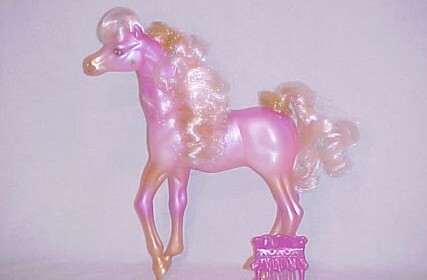 I was told that the production company was willing to work with us (Kenner) to make it better. 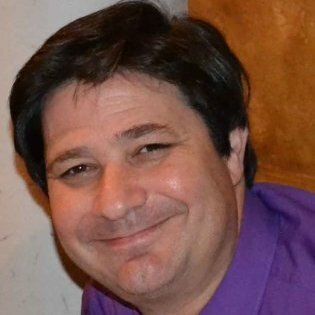 It was not until after the test results came back favorable and we decided to push forward that I met Robert Mandell and really dug into the project. Incidentally, “Princess Tenko” was in the same round of testing, and I did make the models for that also, but it did not score as high. 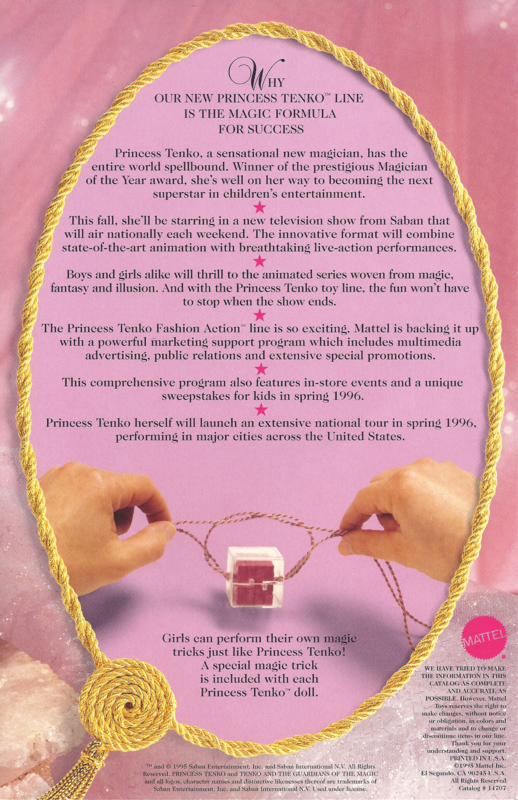 Later, Mattel picked up that line but it did not perform well. 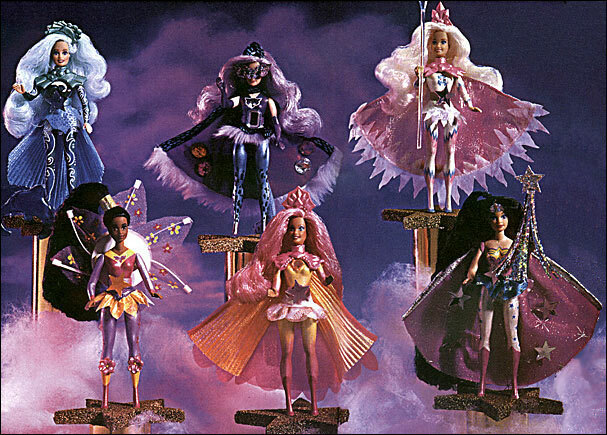 Other reasons why I was given the line was probably due to my work with Disney dolls at Mattel. At that time, Disney NEVER cross branded their properties. 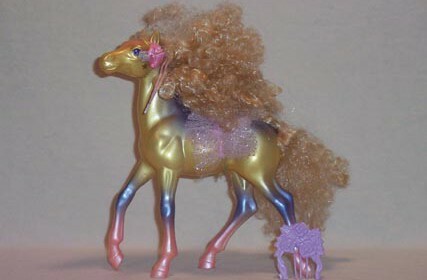 I was given the assignment to turn Cinderella into a fashion doll. After I had been working on it a little while it occurred to me it could work well for 2 to 3 years but it would be even better if we could rotate the characters through a line in the same way Disney was re-releasing its movies to video – every 7 years. 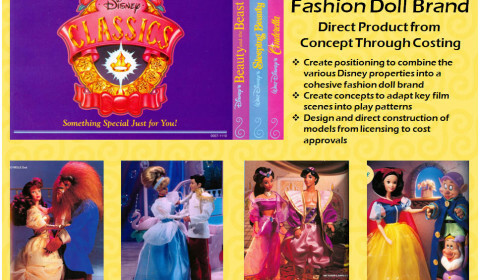 So, with the backing of the Design VP, I pitched the concept to Disney with glorious models. They were very apprehensive at first when I showed them the first two (Cinderella and Snow White) but by the time I showed them all 10 female properties together – they were hooked. 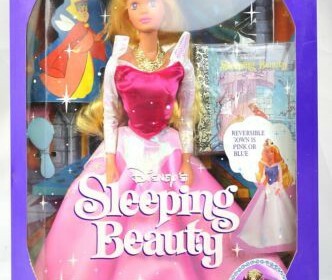 The next year after Mattel’s successful launch of Cinderella and Snow White, Disney launched a new branding program “Disney Princesses.” My fingerprints are still on Disney Princesses every time you see Sleeping Beauty wearing pink. I presented a doll to them with a dress that transformed from pink to blue so the kids could replay that scene from the film. They liked it but wanted it blue in the package. Having all the models in front of me I showed them how many Disney female characters they had that were blond with blue dresses and won them over. Now you almost never see Princess Aurora depicted in blue. 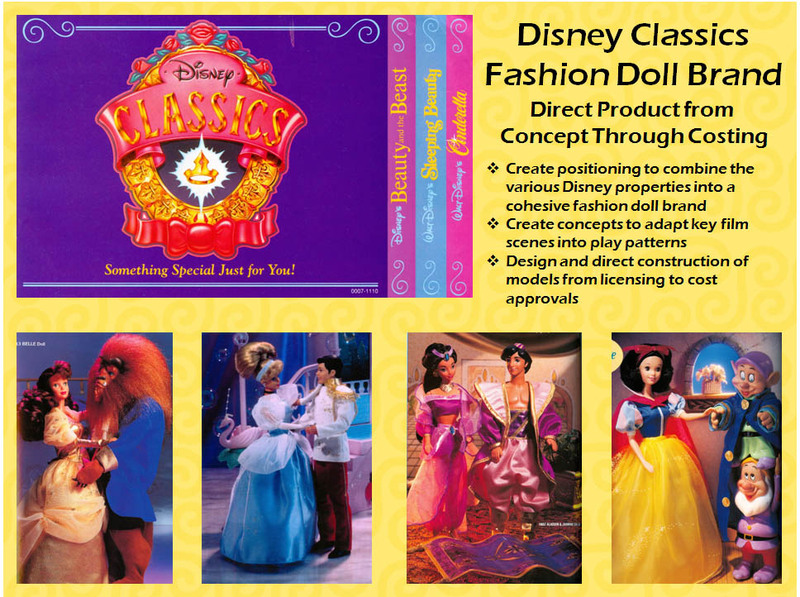 There were many unproduced models for the original Disney Classics (purple box) dolls. There are many very cool ones. 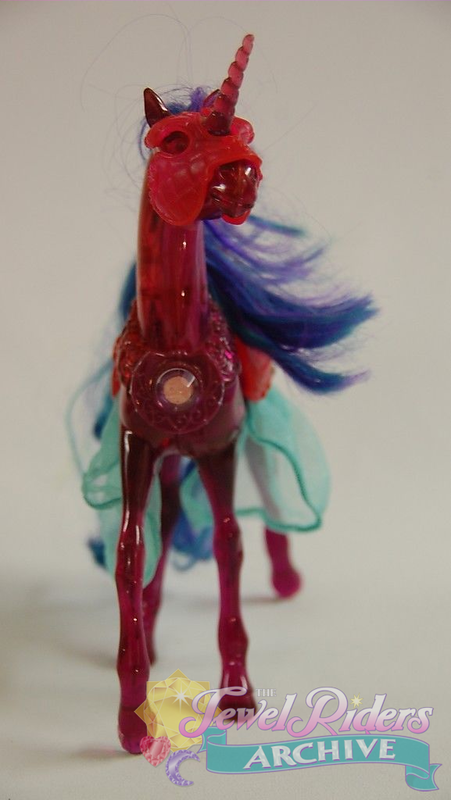 A centaurette from Fantasia, all the other Peter Pan characters, transforming soft catapillar/butterfly, the original wax model of the white rabbit that I sculpted. JRA: Very awesome! 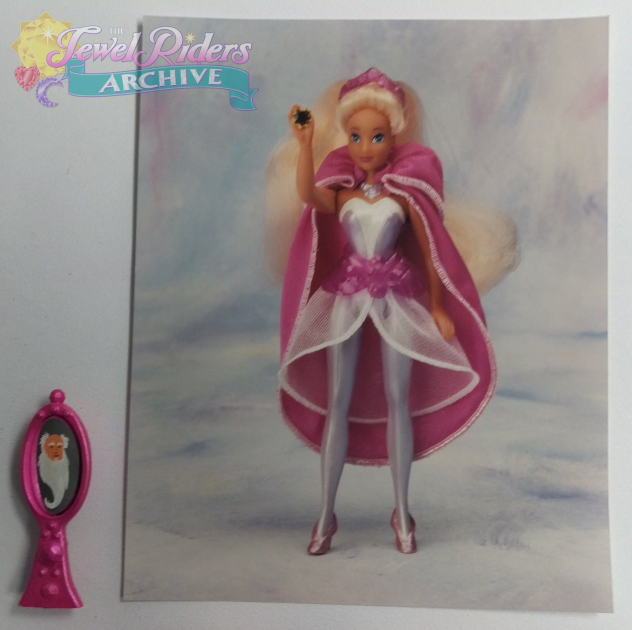 You also mentioned the Disney Musical Princesses and their connection to PGJR, we were wondering if you could expand on that a little? 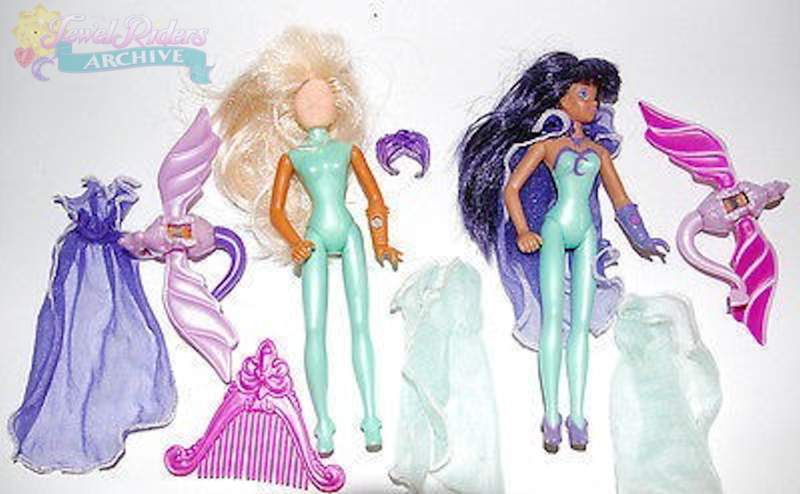 GA: The bodies for the musical princesses were originally sculpted and tooled for the “Wonder Woman and the Star Riders.” But it died at toy fair and never shipped. 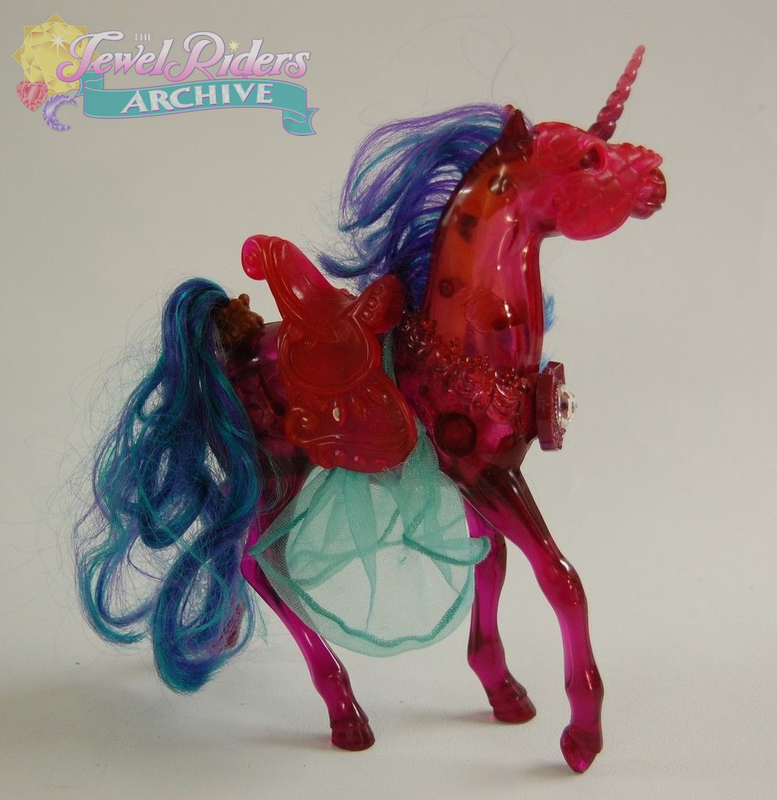 Most of [the Wonder Woman and the Star Riders] doll samples were destroyed because I made the Musical Princesses out of them. 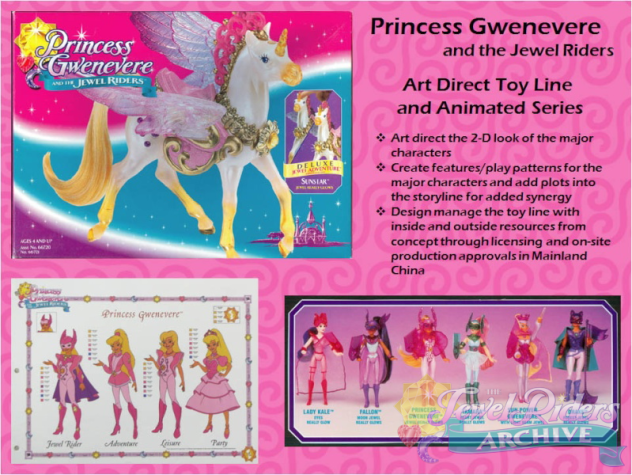 Gwen is the same size as musical princesses but different tools (Editor’s note: Tools are steel molds created from prototypes that are used to manufacture the toy in the factory) since they were made by Mattel’s biggest competitor. If you look carefully, all the Mattel poses are straight and rigid (like a super heroine) but Gwen bodies all have one cocked knee and bent arms for a more natural stance. JRA: Fun! 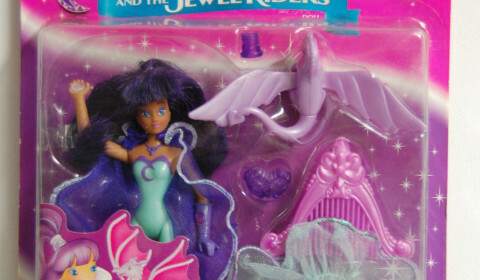 This looks like it was made from the pre-existing Jasmine Musical Princess Doll. 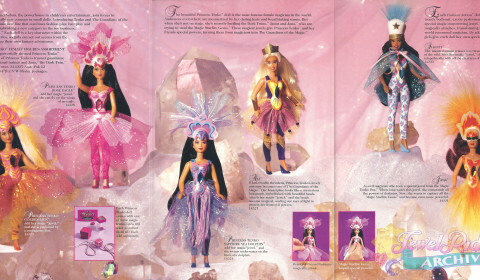 Did Jasmine have that style shoes? 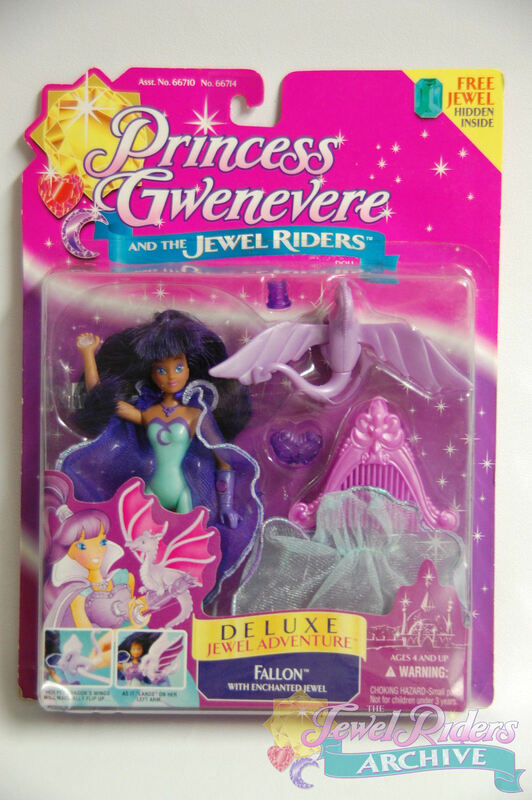 Or are those a Jewel Riders exclusive design? GA: Jasmine would not have worn those shoes. Most likely, I sculpted those onto the existing legs with Sculpy, the heated them with a fine point heat gun. That was one of my typical techniques. 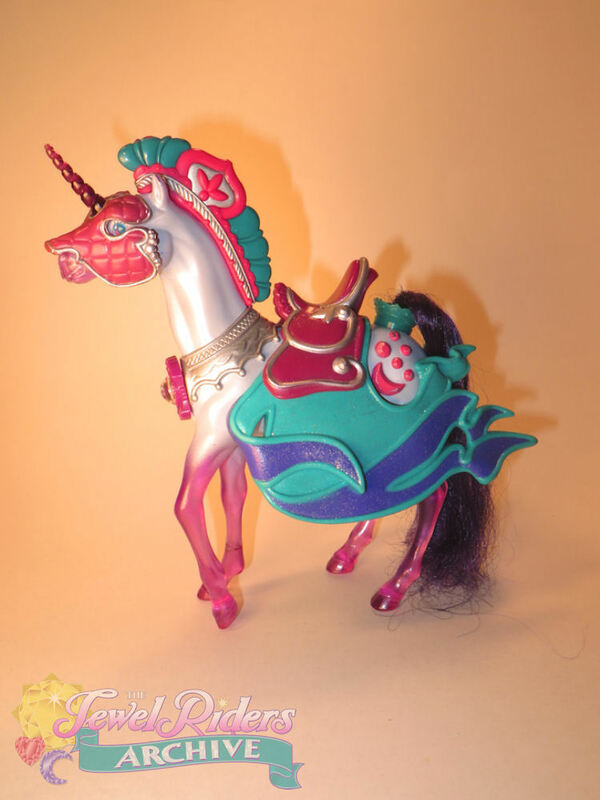 JRA: Were there any other pre-existing toys that fed into Jewel Riders toy design? 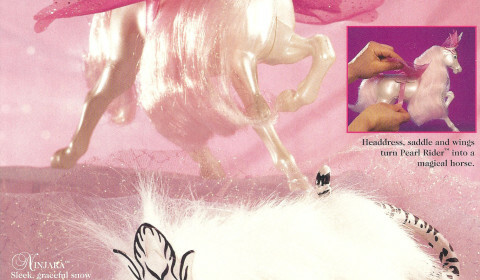 GA: The Gwen horses were Fashion Star Fillies with the rump jewels added to the tooling. JRA: Can you describe your creative process? This came in very handy for Gwenevere. When the second set of episodes was turned on, the only two directions to start with were – 1) Search for wild magic jewels since the first set was all found 2) Use Morgana as the ultimate villainess instead of Lady Kale. One thing I wanted to do was to create a visible use of jewel power other than just shining. I wanted something more like what certain superheroes can do with their power rings and create shapes to solve the issue. 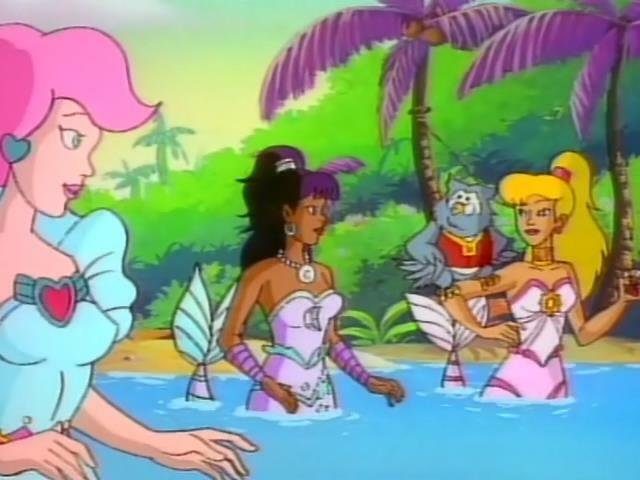 This lead directly to suggesting the trio has an episode underwater to find a wild water jewel and use that opportunity to have them use jewel power mermaid fins. Fortunately, Director Robert Mandell was open to many of my suggestions. That second season had many episodes that grew from my concepts and a very rough storyline suggestion. JRA: We love that “Jewel of the Sea” sprung from one of your concepts. It has long been a fan favorite episode judging by the social media reactions! 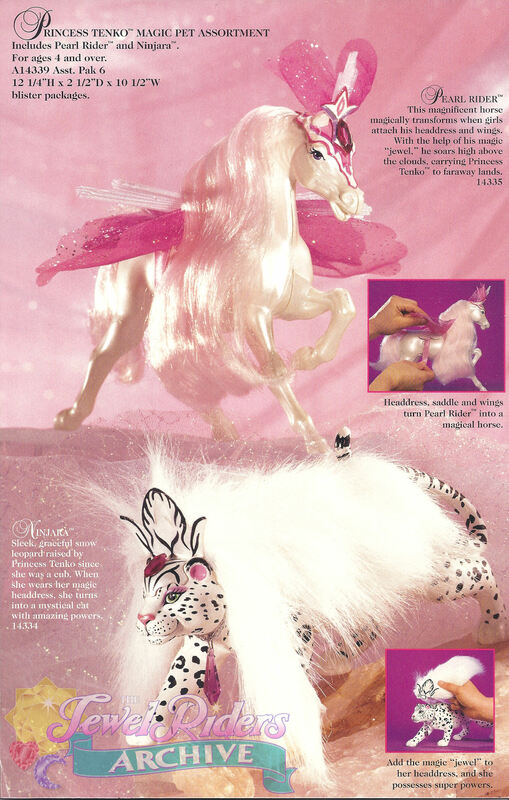 Next, we’d love to know what your favorite product that you designed for Jewel Riders is? 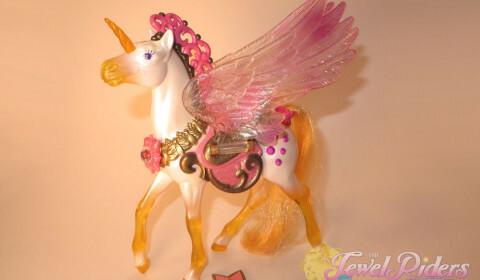 My favorite Princess Gwenevere toy was probably the Zebracorn. 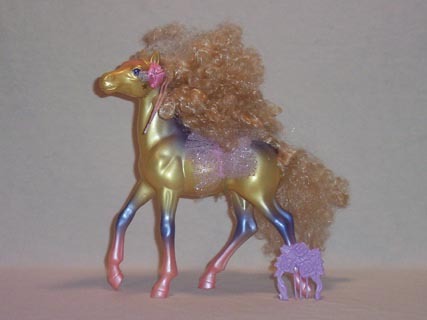 Gwen and Fallon already had special animals. 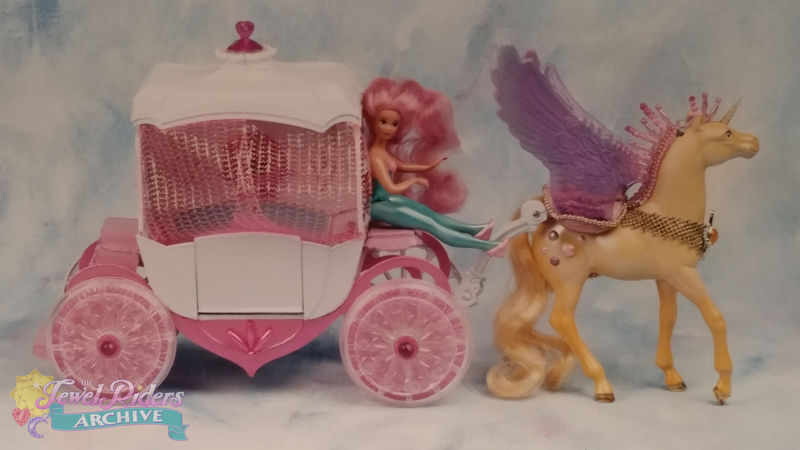 I know Tamara had her small animal friends but she was always limited to having to ride in the carriage. 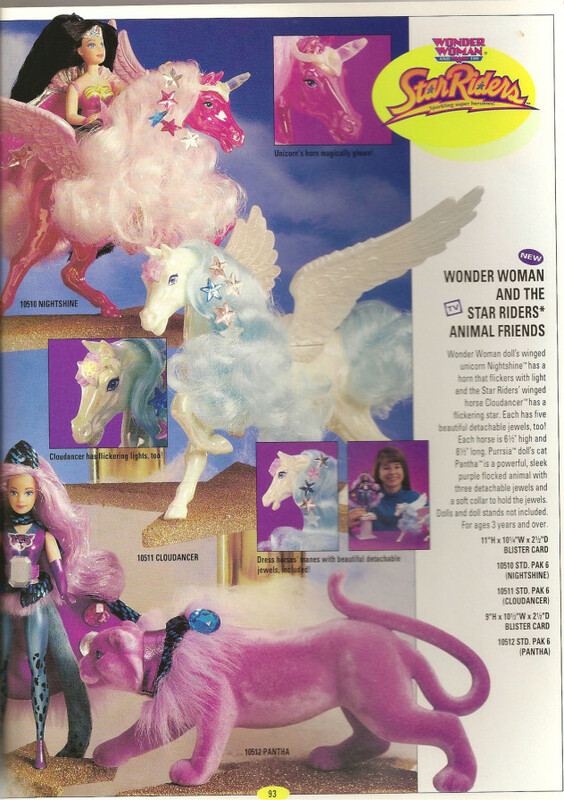 I wanted her to have a special animal friend like Sunstar – but how do you compete with a unicorn and a flying horse. I wanted the new friend to be totally unique and stunning in its own way. Somehow the idea of a Zebra striped unicorn came to me and we made a rough model. The model was especially cool. One of my goals was to try to get as many of the really fun toy ideas into the show. Since Robert Mandell was still working through the rest of the scripts, I suggested the idea. He was unsure but when I suggested the story line to go with it, then he saw the magic and emotion of it and had a script written based on my basic plot outline. There were many other features I was able to convince Robert and the writers to add in, but that character and episode were still my favorite. The whole concept that “some things are more special than you can possibly imagine if you take time to care” was dear to my heart and I hoped others would get it also. JRA: That’s really touching, and we definitely think your message got across in the fan-favorite episode “Shadowsong.” So we’ve talked about your favorite product – now we’re curious which provided the greatest challenge? 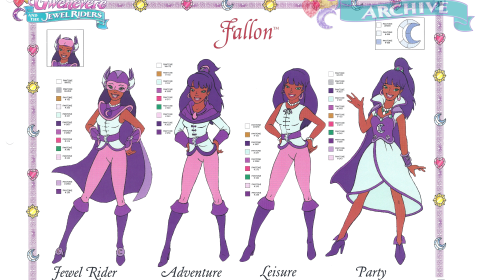 GA: I noticed that Fallon was very popular also. This is gratifying as we put much work into her so she would not be just a tag along character with a different skin tone. 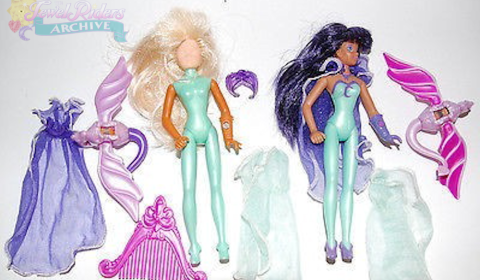 During the time I was at Mattel since they did so many dolls that they were very restrictive on flesh tones. They had only 3 – pink flesh, suntan and black. 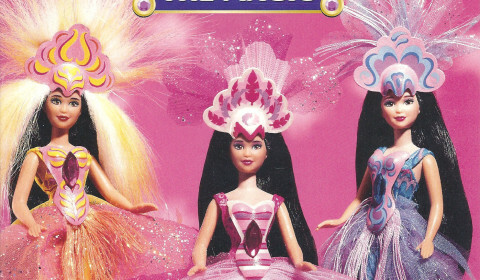 The black skin tone Mattel used, I thought, was very dull, chalky and lifeless. 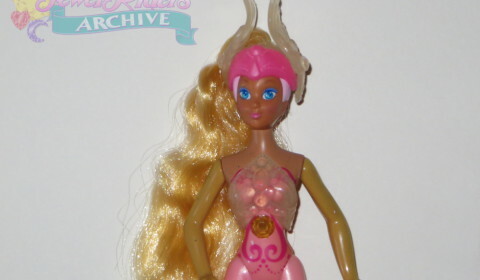 Kenner did not have set skin tones so I worked very hard to find just the right skin tone for her. I did not want her to look specifically African American since we were in a fantasy setting. I also wanted her to appeal to more people. So the skin tone I picked could have made her Caribbean, North African or many other darker skin tones. But the color was alive and vibrant. Robert bought into the idea and gave her an accent that was hard to place – more like Creole. She was one of my favorites to design for since she did not have to look pink and pretty. She was more mysterious and really was the smartest of the three. Tamara was the most empathetic. Gwen was the leader – trying to find her way. 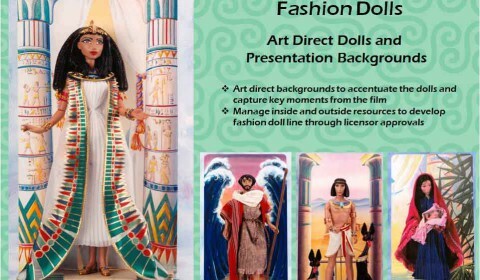 My hard work to get Fallon just right paid off for me personally when I found the Deluxe Fallon doll on a list of “The 10 Best Black Dolls Every Made.” Ironically, a second one on that list was the mother/Queen from Prince of Egypt which I also worked very hard to get right. Both took the time and energy to fight to get them unique and just right. JRA: To your knowledge, was there any development done for a third season of Jewel Riders beyond your toy design work? GA: There was never a plan to do more episodes… yet. If anything was done on it, I never saw or heard of it. Originally, they were just going to do the first 13. Then Bohbot wanted European distribution which required 26. So they made the next 13. They would have made more but were waiting to see how it succeeded. 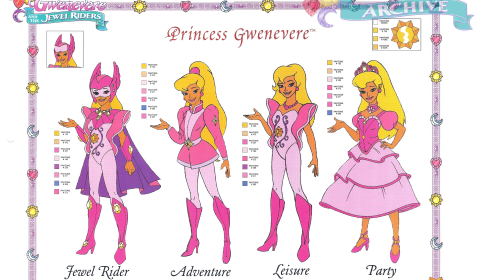 JRA: Do you know why Gwenevere was renamed Starla outside of North America? GA: Two reasons for the question: 1) international names often have to have minor spelling changes or conjunction changes so a simple less specific name translates better (too many ways to translate “princess”). 2) Guenevere was probably being used legally in a country they wanted to release it in. 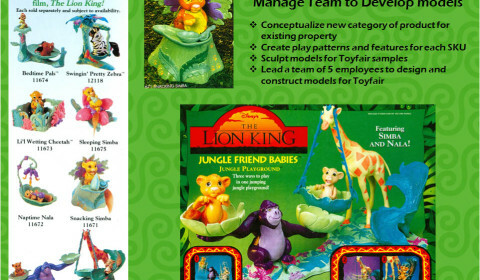 JRA: We were wondering if you could speak to rumors that any possible playsets were in development? 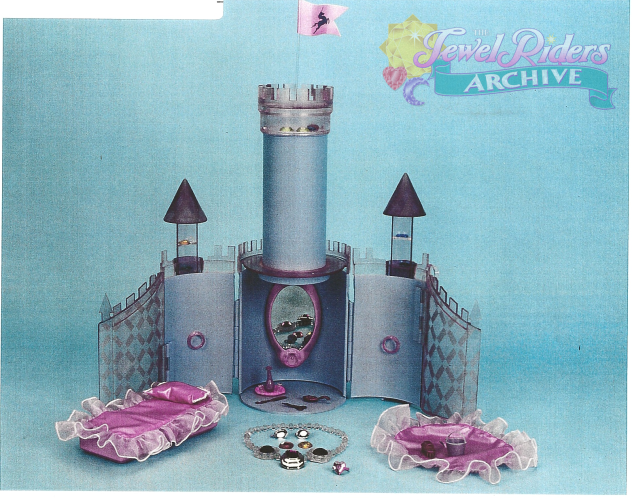 GA: 1) The castle playset shown to consumers in the original testing. Very cool model and design (even if I hand made most of it). It was more like a castle keep but expanded up and out to make a good backdrop for play. But the castle eventually designed for the show did not match it all. I know for a fact that it was destroyed along with many things just before I left. (People starting digging through the Kenner garbage cans looking for Star Wars discarded samples so a grinder was put in place to destroy all trash). 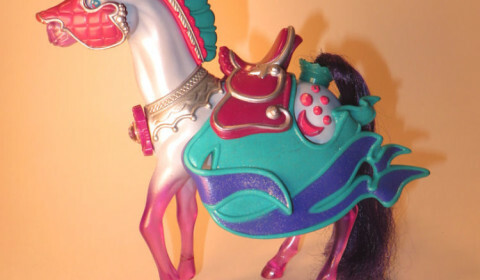 2) Carriage playset – It was okay. A real plastic model was never made of it. 90% sure it was destroyed. 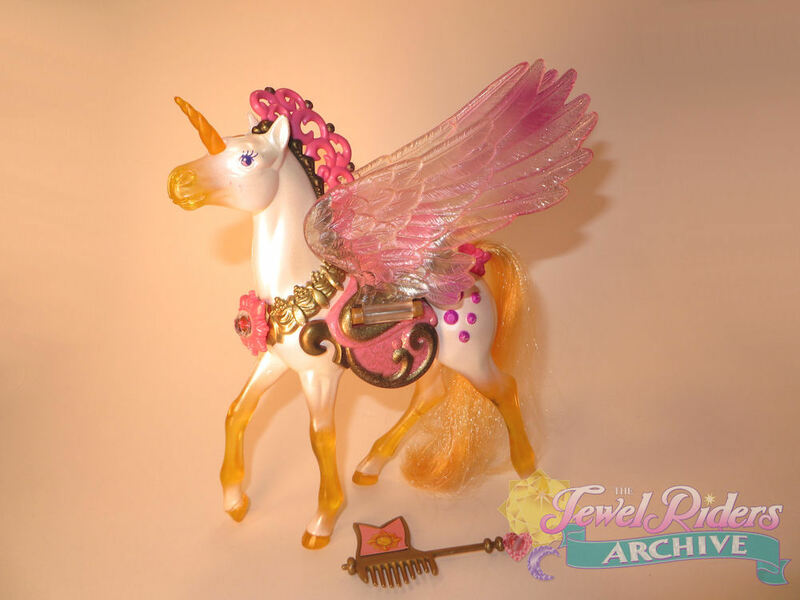 3) Enchanted Forest playset – very basic clamshell sculpted magical trees that open up with jewels to add that would work like a combination of light-pipes (in basic Gwen figures) and light brite. Nothing exists from it that I know of. It was only a foam core model. 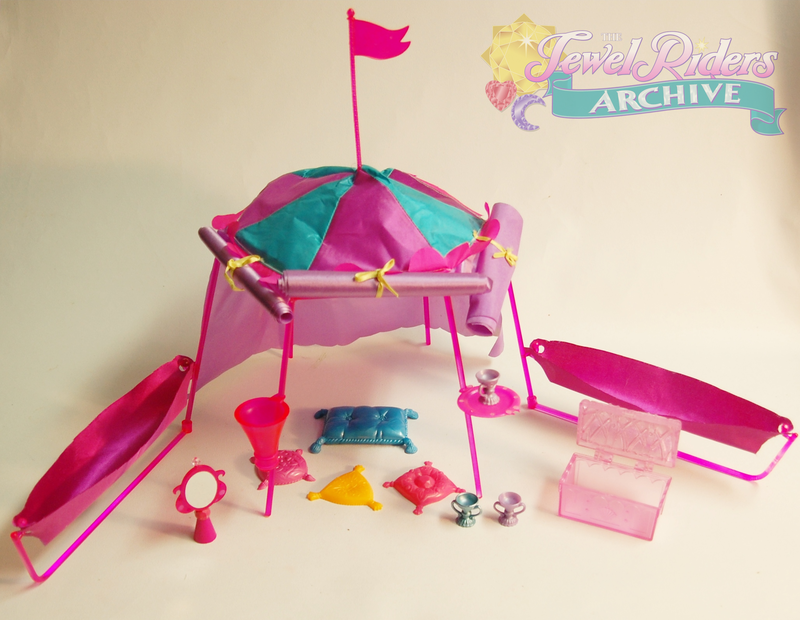 4) Pavilion Playset – the only one management ever took seriously. It was approved to move forward but the line was dropped soon after that decision (since the show could never be found and kept moving its time slot and not notifying TV and other publications). Only one model ever existed. JRA: Very cool! We would have loved any one of those to be produced. Next, we were wondering about the color scheme for the show. 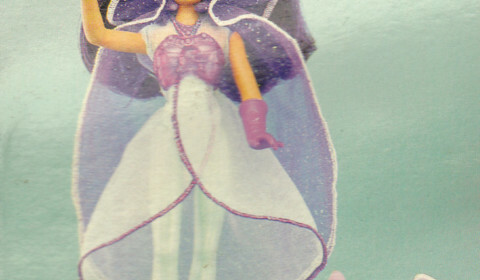 Tamara as a pink-haired magical girl was an inspired choice, as it has been one of the things people remember most vividly from the show. Were you involved in this aspect at all? GA: Tamara – I would have to double check but she either started with red hair and I made it pink or it was pink to start. The teal color was the best color to balance her hair. 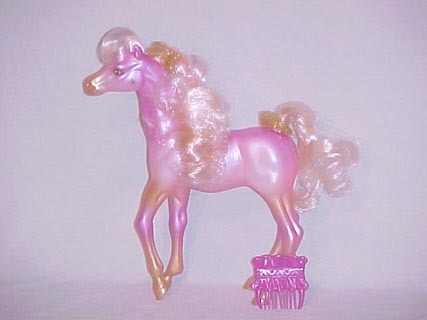 Pink was a cuter way to depict a red-head. It also gave me, two pink characters – one with pink hair and one with pink clothing -Win/Win! Purple/lavender is the second best selling color so I used it for Fallon’s primary accent. It also led to her mysterious quality. When I met with the Aladdin TV show team to do some product, they mentioned that very young kids would have a hard time following a character if they changed outfits. 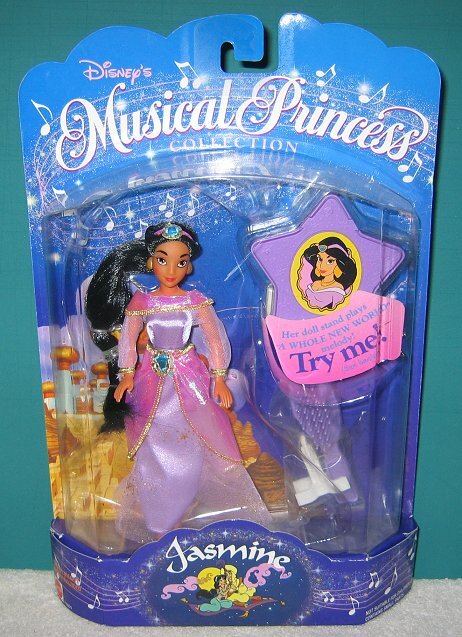 For instance, when Jasmine was put in her brown townsperson clothes, the younger viewers did not get it was her. 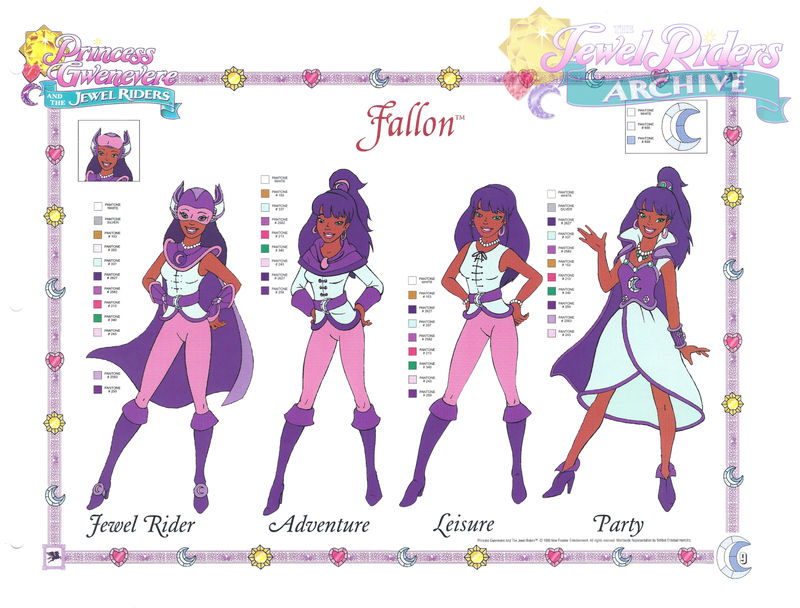 So when I had the chance to do Jewel Riders, I specifically created a palette for each character and stayed with it religiously so the hair color and costume color would always make it easier for younger viewers to follow. It was absolutely intentional. JRA: Greg, we absolutely can’t thank you for taking the time to speak with us about all your amazing memories of Jewel Riders. We really can’t thank you enough for your generosity in sharing so many amazing insights with the fan community. Any special message you’d like to share? 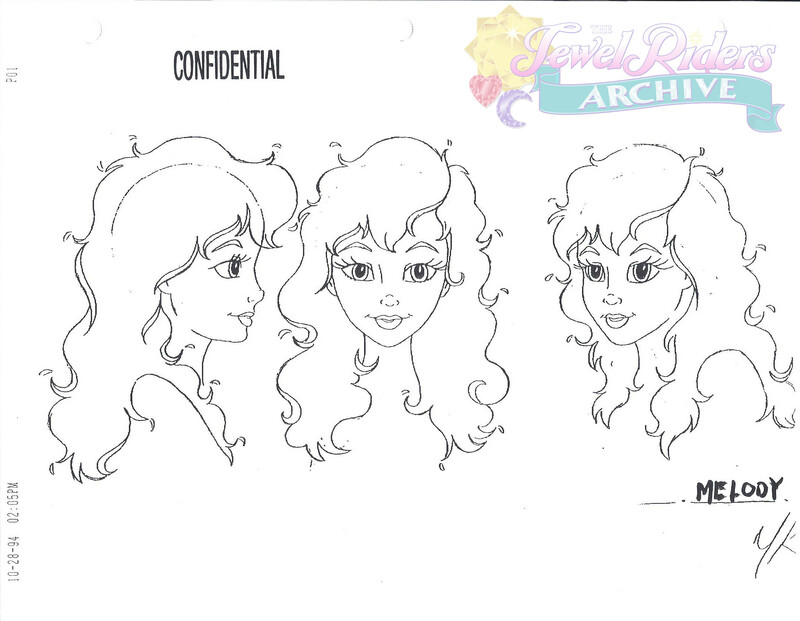 GA: I just went through the work you and Chris have been putting into the Jewel Riders Archive site. It is nicely done. Reading the comments of what it meant to others is touching. For what it is worth, the day I was told the line was officially dropped and I no longer was allowed to play and build in that world, was a very sad day for me. There was so much more I wanted to do with those characters. JRA: Thank you Greg. That means a lot to us too! Even though we aren’t the creators of the series, we definitely feel invested in the characters, the story, and the integrity of the show. What started out as just a love for a cartoon turned into a dedicated… passionate to say the least, commitment that we get a great joy from. Hey Lisa! 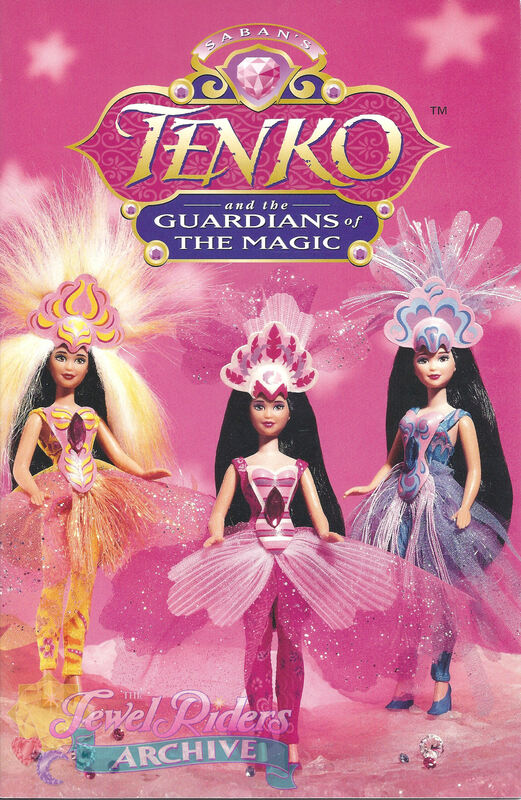 Yeah, it appears that Perfume Princesses and Bubble Princesses were made from the same molds, which were then later used for Tenko as well. Greg had so many neat insights into the show, and so many interesting connections to other brands that my head is still spinning trying to wrap my brain around it all! So glad you enjoyed the interview! I feel the very opposite about the length of the show! I actually thought it was way too short and needed to be longer to thoroughly examine these characters and to give everyone a chance to have time in the spotlight and to be fleshed out. 26 episodes is a full season; A good length for a show is 3 seasons minimum. Am I the only one who really likes the Sunstar pulling the carriage? Or I guess that’d be Amber. Cool design. And it feels tragic that Kenner had to grind its trash. I know, legal important stuff, but my heart can’t help siding with people digging through the trash for cool toy-related bits! I love the sunny golden color on that Amber/Sunstar. And a Crystal Carriage playset would have been beyond awesome! I really wish something like that had come out with the first wave of toys. It would have given all the girls their season one mounts then. 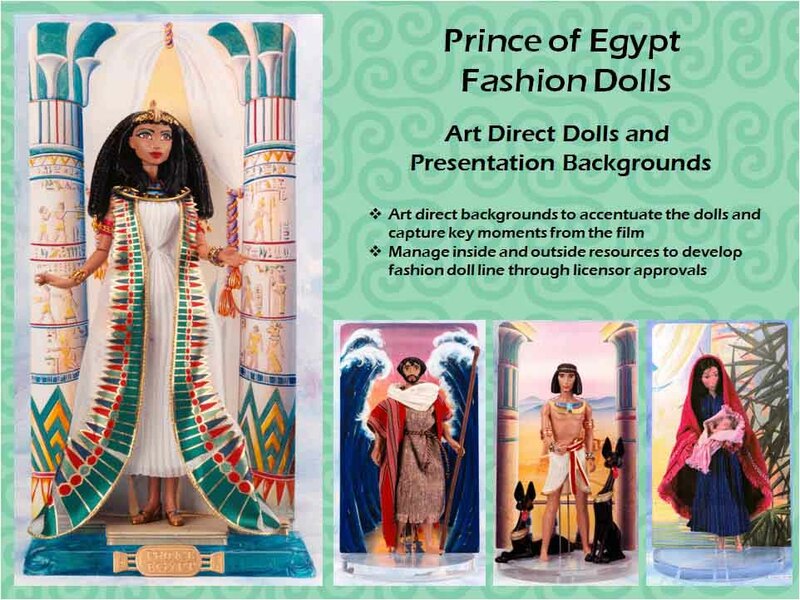 Oooh, and it could have come with figures of Cleo, Sugar, and Spike! And yes, Kenner having to grind its trash because of the Star Wars people digging is tragic. 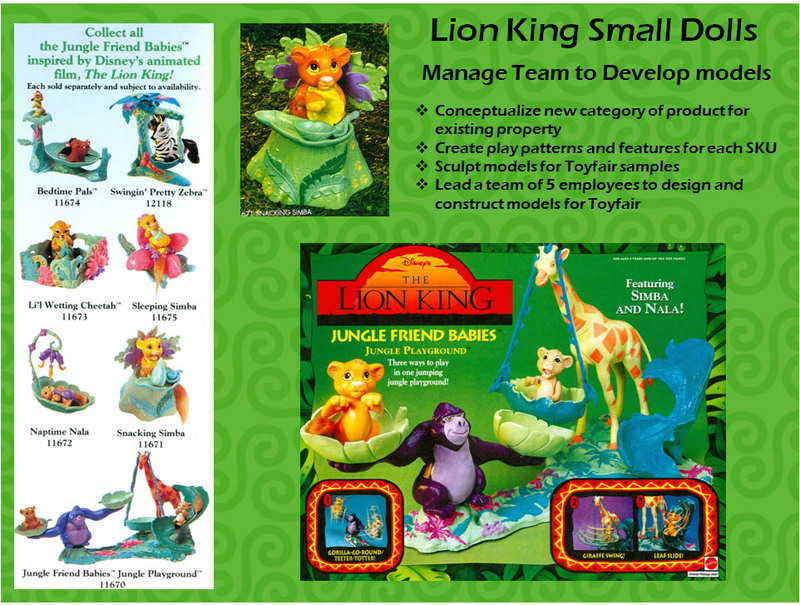 Now that there is such renewed interest in toy design and marketing materials, I bet they could have released an amazing commemorative book with all of that material! 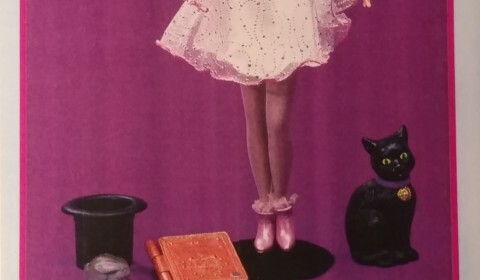 Debbie Reynolds talked about the tragedy of destroying memorabilia, when MGM went through its great purge, and how it was a shame that all of that history was lost; She pointed out how Universal had since built a thriving business off of its sets and what a joy it would have been to be able to do the same with all of those classic MGM pieces. 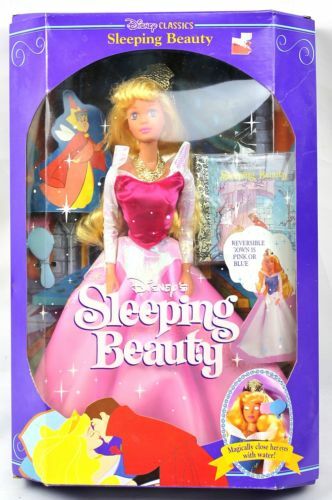 “…Sleeping Beauty wearing pink” So, Greg is the one I have to hunt dow…uh, thank, for the blue dress being a rarity. 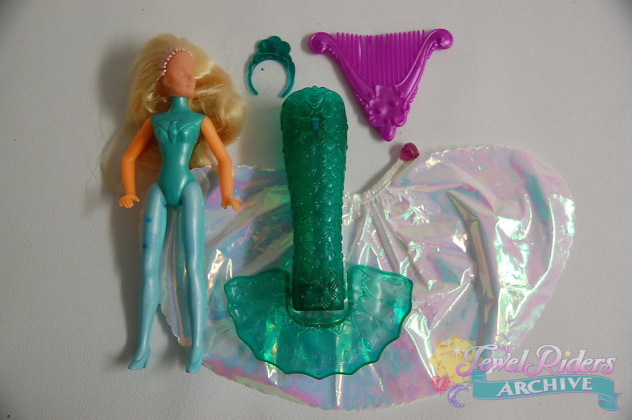 That’s quite a career, and one spent designing the sort of stuff that child me loved to pieces and which adult me has never given up loving (I have both a Lagoona shower and the Totally Hair Barbie collector’s doll on my bedroom desk): Way to go, man. 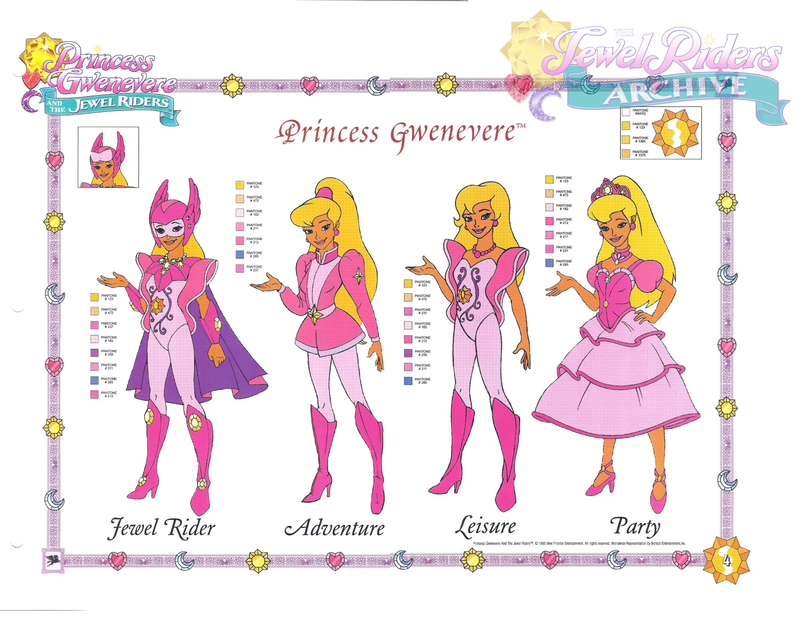 I do have some definite critiques of the Jewel Rider designs, regarding Gwen’s party dress (removing the puffs is a fantastic start), her wedding dress and hair (yeech), and Tamara & Gwen’s ball gowns and hair (????) 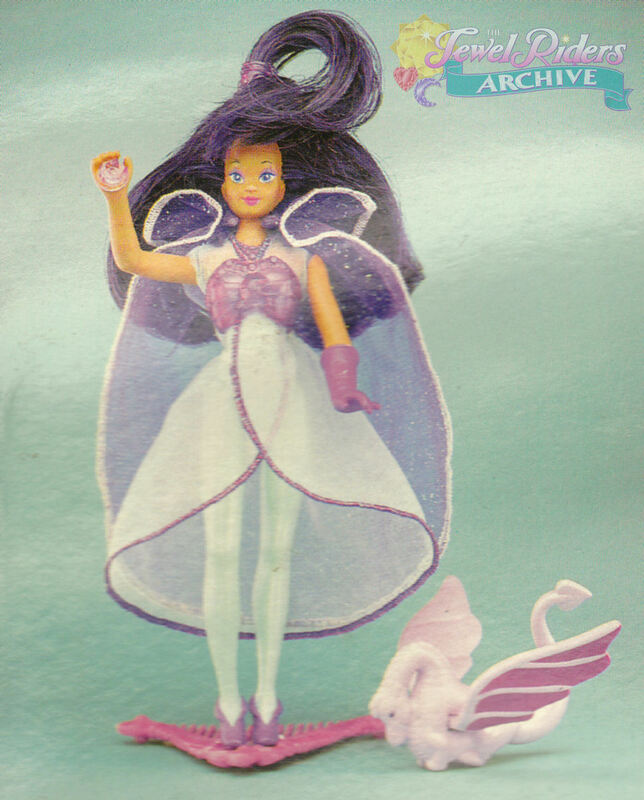 but otherwise am thoroughly impressed that such a frilly line was able to be given memorable and streamlined designs for its characters and their costumes. Outside of the mentioned steps that went clean off of the cliff, A+. It’s nice that Greg was able to share his memories about this passion project. 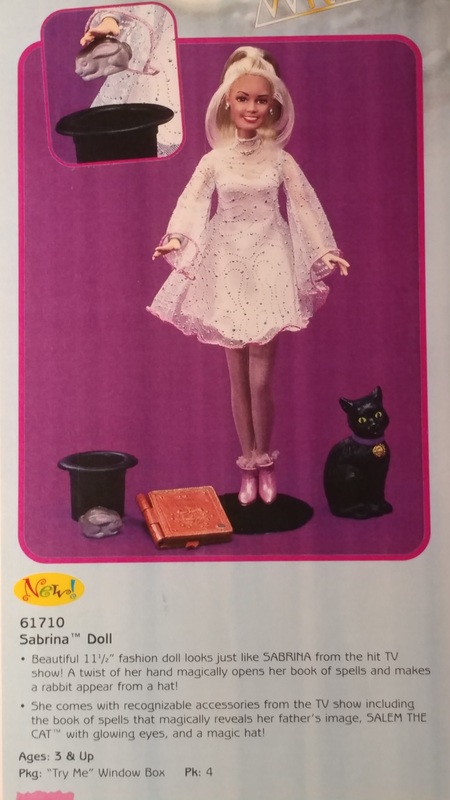 I do wish that the doll line had been able to keep going so we could have seen more.